ArtScroll released two amazing new Haggadah’s this year. Now, we’re giving one of our blog readers a chance to choose which Haggadah they would like to win! Click here to learn more about The Rav Chaim Kanievsky Haggadah. 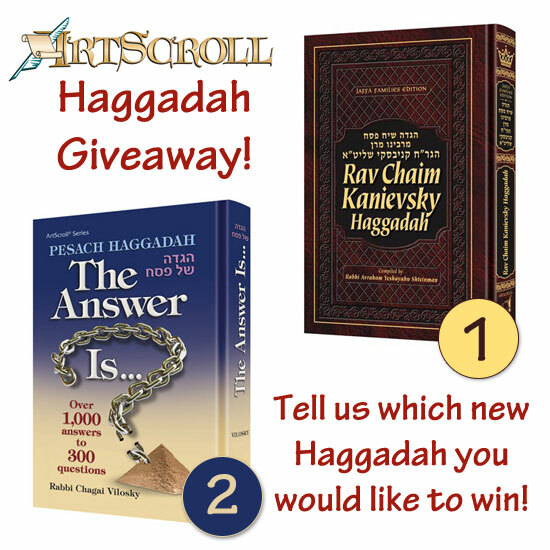 Comment on this post telling us which of these two Haggadahs you want to win! That’s it! You can increase your chances of winning by entering our Instagram (@ArtScroll) and Facebook giveaways as well! **Giveaway ends on Sunday, April 6th at 11:59 pm eastern time. Prize can be shipped within the USA. Winner will be notified via email. Valid email address must be provided to claim prize. Limit one entry per person. I’d love The Answer Is. Q&A always brings me back to my childhood seders. I’d like “The Answer Is…” – please! A Kosher & Freilichen Pesach! I’d have to pick “the answer is”. Looks fascinating! The Rav Chaim Kanievsky Haggadah…thank you 🙂 ! I think the “The Answer Is…” hagadah i woulk like. Its straightforward answers to straightforward questions and is an indispensible tool to understand all the “why”s associated with Pesach, the Seder and of course the Hagadah itself. The Answer Is. Would love to have that handy as I lead the seder this year. I would like the R’ Kanievsky one! Thanks for the chance! i would like to win the “answer is” haggadah. i need answers to the questions that i will be asking myself and others. I’d like to Rav Chaim Kanievsky one, but for my seder I think the best is The Answers one; it’s awesome! Please please the Rav Chaim Kanievsky Haggadah!! “The Answer Is”. I like question and answer format . I want the Rav Chaim Kanievsky Hagadah! “The Answer Is…” Thank you! I would love to win “The Answer Is”!!!! The Answer Is. Maybe I can learn something new. #2 – “The Answer Is” for sure!!! This would be a tremendous help to me. Thanks! The Answer Is…. A Seder is defined by its ability to teach through question and answer. The Seder would be a great way for my wife and I to celebrate our first Seder together with the guidance to the right questions to ask. I’d love to win “The Answer Is”! Sounds like a great way to liven up the seder. I’d love “The Answer Is” Time to move past Maxwell House and get more serious. My hearts desire is… “Rav Chaim Kanievsky”, But my minds Desire is… “The Answer is” So… I’ll tell you what to do… Sit down and pray to HaShem and ask Him which one He Wants you to send to me, Because you know as I do, that The L-rd Knows Best.